Tanzania singer Diamond Platnumz' Kenyan girlfriend Tanasha Donna has been on a roll in the last few days on social media. From describing how her boyfriend satisfies her in bed to how much she spends on clothes every week. But she won't stop at just that. 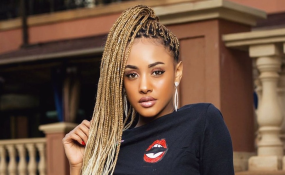 Tanasha has now taken a dig at her ex-boyfriend Nick Mutuma whom she has described in very derogatory terms. Taking to Twitter, the presenter at NRG Radio termed her ex as a 'fraud' who has a 'tiny' male member and is very lousy in bed. "Y'all talking about My Ex Nick Mutuma. He was A Fraud. He never fulfilled me," she tweeted. In another tweet she said that no Kenyan man can 'do' what Diamond 'does' to her in the bedroom. My Diamond Loves It When Am On Top 🔥. The 22-year-old radio presenter, who is also a video vixen, split up with Mutuma in August 2017, after dating for about seven months. Tanasha's latest posts seem to have been taken from the same script as Diamond's. In December 2017, the Tanzania singer similarly waxed lyrical on social media about his new girlfriend's A game in the bedroom. The two lovebirds have enjoyed a whirlwind romance since going public about their relationship in November.